The Welding Journal has been published continually since 1922 — an unmatched link to all issues and advancements concerning metal fabrication and construction. Each month the Welding Journal delivers news of the welding and metal fabricating industry. Stay informed on the latest products, trends, technology and events via in-depth articles, full-color photos and illustrations, and timely, cost-saving advice. Also featured are articles and supplements on related activities, such as testing and inspection, maintenance and repair, design, training, personal safety, and brazing and soldering. 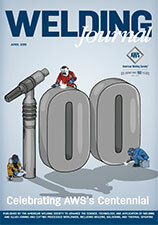 Become an AWS member today and receive Welding Journal delivered to you automatically every month! Annual subscriptions are also available. For article and editorial submissions to be featured in the Welding Journal, please contact Mary Ruth Johnsen: mjohnsen@aws.org. Some of the most active and influential buyers in the industry read the Welding Journal. As active members of the Society, they have a long-term commitment to welding and metalworking. Advertise with us! Download the AWS Media Kit in PDF format.